There was a time in my life when I was deeply depressed during the holidays. I felt terribly alone and dreaded the entire experience. I realized later in life that those feelings of depression were brought about because I didn’t know my purpose and therefore couldn’t fulfill it. Now I love the holidays. For me it signifies a renewal process. As much as I don’t like snow, or ice, or salt trucks, I know seeing them is a sign of progression of the seasons and the years. Every holiday for the last few years, I have set attainable goals for myself, both personally and professionally. I have achieved each and every one of those goals, along with some I didn’t expect to achieve, such as becoming the 2013 Confident Woman Award recipient. This holiday isn’t any different. I’m writing my third book. I’m producing and creating more video content. I’m making myself available for speaking engagements going into 2014. We officially have a BBM Channel as of December 2013, we have a mobile app being developed for release in 2014, a Vimeo Channel, an official YouTube Channel (that’s not new, but it’s still cool), and we’ll be producing more online content starting next year. 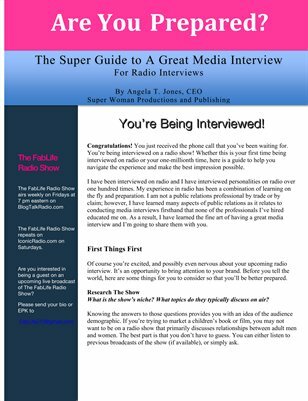 We’re also already scheduling our guests for The FabLife Radio Show, which reached over 43,000 listens and had over 50 subject matter experts and celebrity guests in 2013. We will resume live shows the first Friday of January. I’m growing the Super Woman Brand and I’m looking forward to another new year of growth and progress. I’ve come a long way and I want to be an example to others that life is truly what you make of it. Many of us have had experiences that haven’t been pleasant, some of us more than our fair share. But instead of looking at every situation as a tragedy, I now look to discover what I’m meant to learn from it. And sometimes what I think is a tragedy is actually a blessing for me. As we go into the holiday season which will close out this year, I’d like for you to look back on some of the situations you’ve experienced this last year. Look at what your role was in the situation, but don’t blame yourself, just accept responsibility for what you did or didn’t do so that if you’re ever in that situation again, you will know better. Apologize to those you have wronged, forgive those who have wronged you, while keeping in mind that you’re not obligated to include them in your life going forward, but closure can be healing. Healing allows you to grow and move forward. Don’t regret anything for any reason. I’ve learned that regret will hold you hostage if you’re not careful. Everything happens and yes, sometimes we let opportunities pass us by, but if you know you did you best, you shouldn’t have any regrets. If you know that your regret comes from the fact that you didn’t do your best and you could have done something better, you actually have time to rectify that if you choose to. Sometimes the fear that an opportunity has completely passed us by is the main reason we don’t try. Not trying is the only regret I condone. If you don’t at least try, you will never know if you are able to do better or obtain closure. Look forward. The past is behind you for a reason. It’s not coming back. So concentrate on the present and the future. Be realistic in your endeavors and goal setting. Everyone can’t be a super model or a professional athlete. Take the time to discover what the Master’s Plan for your life is that includes your talents and abilities, and strive towards cultivating that. Trying to be something other than what you were meant to become is a complete waste of time and energy. Trying to be what someone else is out of envy is also a complete waste of time and energy. Instead put in the work to be the absolute best version of yourself that you can be in 2014 and beyond. Discover what you do best and do that. That’s my focus – to be the best version of myself, today, tomorrow and everyday after. It’s my own personal New Year, New You project. I didn’t necessarily plan any of this, and I’ve had to make some very unexpected sacrifices to get this far. I know that more sacrifices will be required of me but in the end, the life I’m meant to live will be well worth it because I will have been a blessing to others in the process. Thank you for your support of Super Woman Productions and Publishing and I will have a lot more for you in 2014.